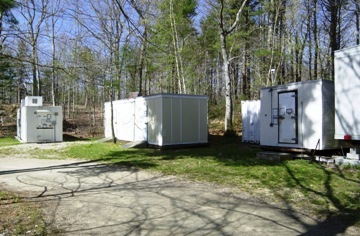 The Woods Hole Science Center's Sample Storage Facility: Marine samples are stored in ambient, refrigerated, and freezing atmospherically controlled vans adjacent to the USGS offices on the Quissett Campus, Woods Hole, Massachusetts. Click here for larger image. The Woods Hole Science Center of the U.S. Geological Survey (USGS) has been an active member of the Woods Hole research community, Woods Hole, Massachusetts, for over 40 years. In that time there have been many projects that involved the collection of sediment samples conducted by USGS scientists and technicians for the research and study of seabed environments and processes. These samples were collected at sea or near shore and then brought back to the Woods Hole Science Center (WHSC) for analysis. While at the center, samples are stored in ambient temperature, refrigerated and freezing conditions ranging from +2º Celsius to -18º Celsius, depending on the best mode of preparation for the study being conducted or the duration of storage planned for the samples. Recently, storage methods and available storage space have become a major concern at the WHSC. The core and sediment archive program described herein has been initiated to set standards for the management, methods, and duration of sample storage. A need has arisen to maintain organizational consistency and define storage protocol. This handbook serves as a reference and guide to all parties interested in using and accessing the WHSC's sample archive and also defines all the steps necessary to construct and maintain an organized collection of geological samples. It answers many questions as to the way in which the archive functions.